I was going to call this review "I ain't dead," because... well... I'm not. But it's been so long since I updated this blog, anyone who reads my stuff (do you exist? Let me know!) might think I had shuffled off this mortal coil. As it happens, I've just been spending a lot of time promoting my series of fantasy books, The Legend Riders, and time has gotten away from me a bit. But I'm back now, so here's a little review about a game that isn't really much of a game at all: Cthulhu Dice. 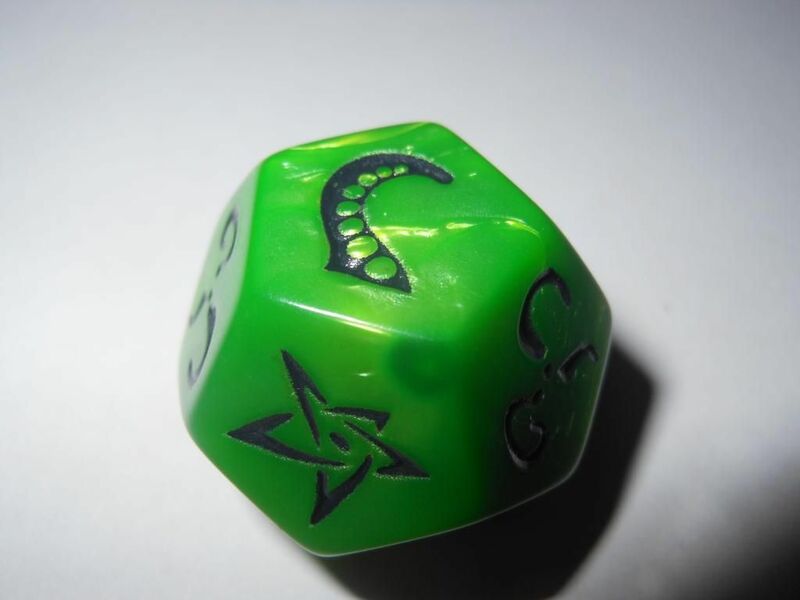 Okay, before I begin, I'm going to talk about the name Cthulhu Dice. In the UK, the word "dice" is both a singular and a plural. However, in America, "dice" is the plural of "die." That means, it may be surprising to an American audience that Cthulhu Dice contains just one dice (er, die... whatever). Apparently, the reason for this is because Steve Jackson didn't want the game to be called Cthulhu Die, on the grounds that Cthulhu can't die. Don't know who Cthulhu is? Then you haven't read enough of the works of H P Lovecraft. Right, with that bit of silliness out of the way, let's talk about the game. Cthulhu Dice does not have much in the way of components. It ships in a blister pack which is discarded after opening, and from then on all the components are stored in a small ziplock bag. At least it doesn't take up much space on the game shelf. The components are 18 glass beads (the kind you can get pretty much anywhere, but which are quite nice to handle anyway), a crumpled rules sheet (honestly, it is folded up so small to fit in the blister pack, it looks like it has been mauled by a Hound of Tindalos), and a 12-sided dice (die... whatever). The dice, it has to be said, is really nice. You can get different colours, and it is really chunky with nicely embossed symbols. My wife bought this game for me because I am a fan of Lovecraft's writing, and she thought the dice was cool. She wasn't wrong. The rules... No, I didn't screw them up in frustration. The storyline behind the game is that the servants of Cthulhu (one of the characters from H P Lovecraft's pantheon of eldritch horrors) are trying to dive each other mad. Why? Don't know. Doesn't really matter. 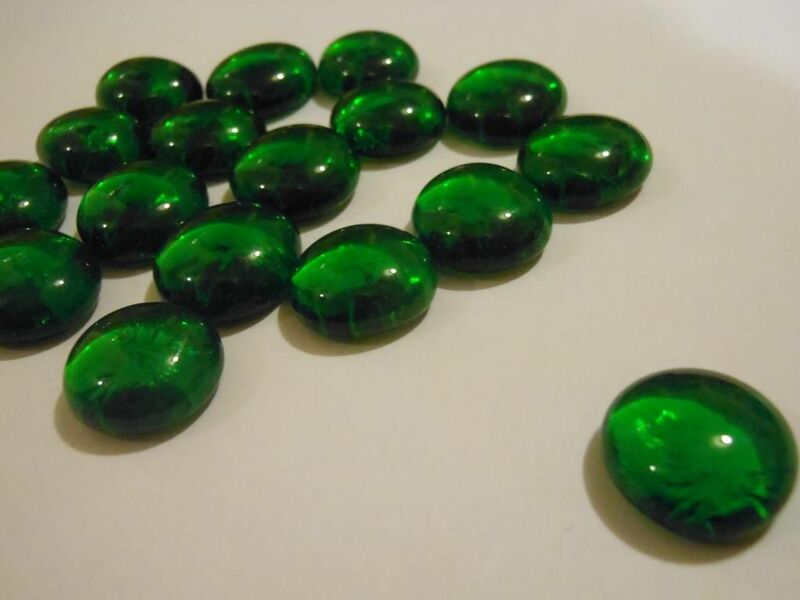 Each player takes three green beads, which represent sanity. Going insane is such an important part of the works of Lovecraft that sanity, and keeping it, are pretty much staples of any game based on his writing. The owner of the game decides who will be the "Caster" first (and why wouldn't you pick yourself? ), and then the Caster picks a "Victim" and rolls the dice. The dice has different symbols on it rather than numbers, and the symbol you roll determines what happens. Roll the Yellow Sign: The Caster's Victim loses one sanity to Cthulhu (a pool of sanity in the middle of the table that starts empty). Roll the Tentacle: The Caster TAKES one sanity from the Victim. This happens even if it was the Victim who rolled the dice. Roll the Elder Sign: The Caster gains one sanity from Cthulhu (the pool in the middle of the table), if possible. Roll the Cthulhu symbol. Everyone loses one sanity to Cthulhu. Roll the Eye: The Caster chooses any result. After applying the result of the roll, the Victim will roll in retaliation, and the result of the roll is applied. The player to the Caster's left then becomes the new Caster, and play continues. You can't choose to pass, and the only choices you will have to make are who will be your Victim, and what result to choose if you roll the Eye. These are really not choices at all. If you loss all your sanity points, you are insane. You can still attack, but you cannot be attacked, and the only way to become sane again is by winning sanity from Cthulhu with the Elder sign (or by rolling an Eye, and then choosing the Elder Sign result). The winner is the last person to remain sane. If everyone goes mad, then Cthulhu wins. Either way, no-one will care. Yes, the game really is that simple; and yes, it really is that bland. There is no strategy, and there are no interesting choices to make. Of course, the game is clearly not trying to be the new Chess, but even as a silly filler game it is severely lacking. Over on BoardGameGeek I gave this game two stars out of ten. That was reviewing the product as a game. However, the product does have merit as a way of choosing the first player for a real game. There are many games on the market that don't offer a real way to select the first player: They just say "choose at random" or they pick some silly method such as "the person who most recently went to an island is the first player." 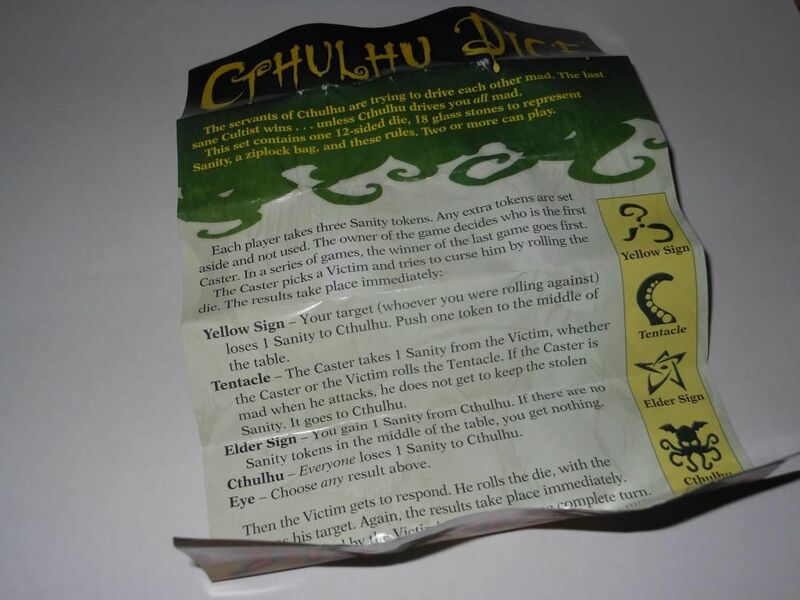 If you are about to play such a game, you can whip of the Cthulhu Dice and play a quick round. Cthulhu Dice is over in two or three minutes, and the winner gets to be the first player in the proper game you are about to play. 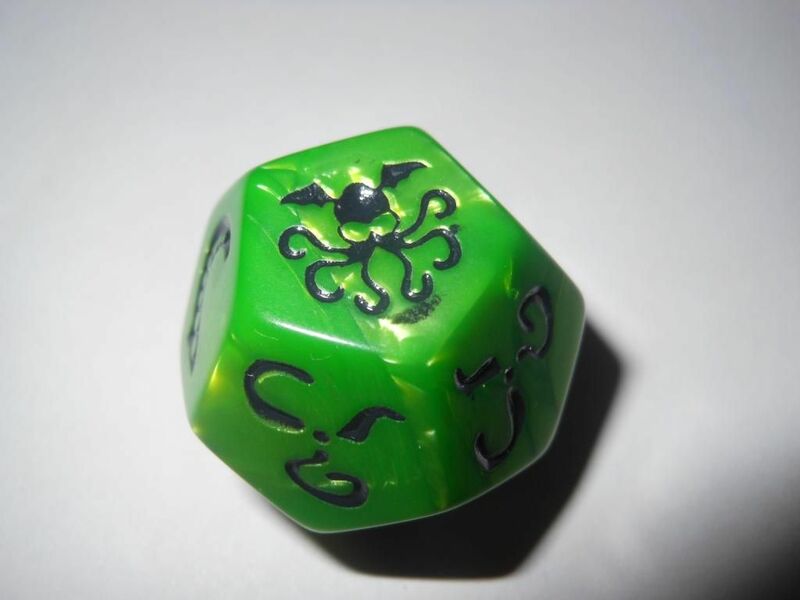 I suppose Cthulhu Dice could also be used as a drinking game, with shots replacing sanity tokens; but I'm a married man with a child, and my days of drinking games are far behind me. Besides, drinking games aren't good for you. So, all told, I don't really think much of Cthulhu Dice. However, I am going to keep it. It is so small it hardly takes up any space, I like anything with a Cthulhu flavour, and the dice is really nicely made. If those sound like good enough reasons to own something, then you may want to pick up a copy; just don't expect much of a game. I have seen a variant of the rules where you use more than 3 tokens for sanity and in addition to rolling the Cthulhu die (dice, whatever), you also roll a standard d6. 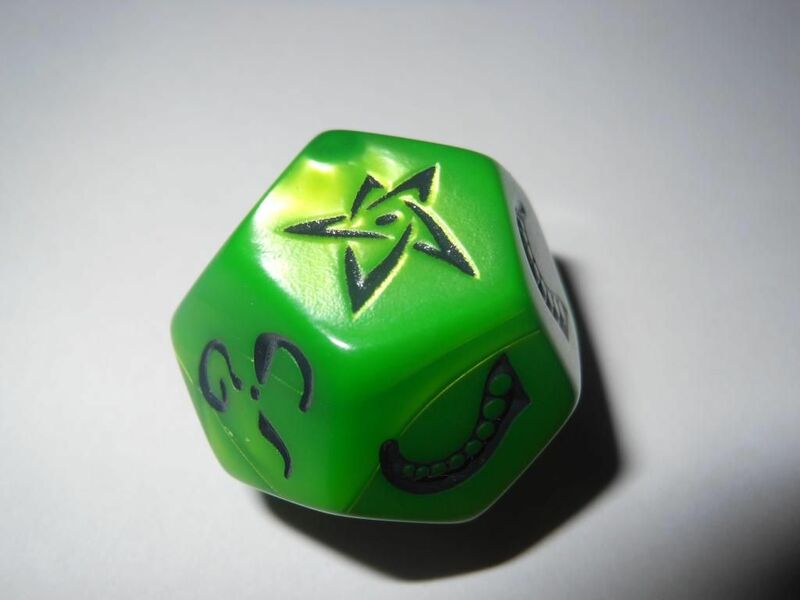 The result of the d6 determines how many tokens are taken/given with the result of the Cthulhu dice roll. I have tried this with some friends and it makes the gameplay longer, and the added effect of the d6 makes it even more random, which in turn makes it more fun. Just thought I'd share. Thanks for stopping by and sharing; I might try this variant, especially as I have some Call of Cthulhu RPG dice kicking around somewhere. However, I am not sure I am keen on any idea that makes this game run any longer than it already does. 2-3 minutes is really enough for me.